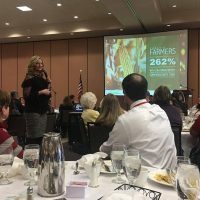 The Wisconsin FFA Alumni Association 39th convention and annual meeting was held this weekend, February 8 – 9 at the Stevens Point Holiday Inn and convention center. Nearly 325 FFA Alumni members from across the state of Wisconsin attended this year’s event. The convention kicked off Friday morning with the state council quarterly meeting. The early afternoon attendees had the opportunity to participate in a 3-stop tour of O’so Brewing Company, Sunset Point Winery and Great Northern Distilling. The primary festivities kicked off with a social and live auction on Friday night, followed by music from Soggy Prairie band. Saturday was packed full with an array of activities for FFA alumni members. Members from each of the 10 sections met early in the morning and then joined with other sections, to learn about what is happening at the state level and to plan for future conventions. National FFA Alumni Executive Director Joshua Rusk then shared the many opportunities available through the National FFA Alumni Organization. The Opening Session followed and was full of numerous awards. Four local chapters were recognized for their reactivation. These included Brillion, Dodgeland, River Valley and West Salem/Bangor. American Family Insurance was recognized as a newly chartered non-traditional chapter. Oconto Falls FFA Alumni chapter was named the State Website Contest winner and Denmark won the Newsletter competition. The 2018-19 Wisconsin FFA Officer Team played a vital role in the operation of the convention. They were recognized for all being Lifetime members of both the state and national FFA Alumni and the 2017-18 team was honored for being named a 100% State Lifetime Team at the national convention this past fall. Members heard from the various leaders of the other organizations that are part of Team Ag Ed and were presented the annual financial report and budget during the annual business meeting. The bylaws were amended to align our membership year to the national year and to clarify associate membership and council service. The election for Vice President was also conducted. The luncheon guests were all treated to a presentation by Kim Bremmer, creator of Ag Inspirations, a website and speaking venue with a mission to inspire farmers to tell their stories, connect people to where their food comes from and present the great successes of American Agriculture today. After lunch, members had the opportunity to tour one of three places, Feltz Daiy, University of Wisconsin Stevens Point Waste Water Management program or Point Brewery. Numerous workshops were also offered throughout the weekend including Idea Sharing and Networking, Parliamentary Procedure, This is Us…Past, Present and Future, Telling the Story of Agriculture (a continuation of the program with Kim Bremmer, Membership rosters and resources and Growing connections. The Wisconsin FFA State Officer team also presented an inspirational reflections program. The banquet was full of numerous awards and recognition. Jordan Donnerbauer from Stanley-Boyd was named the Outstanding Agriculture Educator. The Outstanding Young Member Award was presented to Emily Watson from Elkhorn. Chapter support grants were awarded to Baldwin-Woodville, Darlington, Edgerton and Granton. Weyauwega-Fremont FFA Alumni was named the Outstanding State Chapter in the small division and Waupaca was named Outstanding Chapter in the medium division. Winning the large division was the Sauk Prairie FFA Alumni. Denmark and Stoughton FFA Alumni chapters both received gold ratings in the National Outstanding Chapter Awards and will have their applications submitted to the national level of competition. Denmark was also recognized as the overall winner in this area. Outstanding Achievement awards were presented to Don and Barb Quam of Stoughton and Mark Olsen of Denmark. Mark’s application scored gold so he will be advancing to National competition. The Dr. V.O. Martinson Award is given to the FFA Alumni who had the greatest increase in annual membership percentage. Greenwood FFA Alumni is this year’s recipient. The Ann Martinson Award is given to the chapter who has had the greatest increase in lifetime membership. Granton FFA Alumni received that honor this year. Joe Loritz of Denmark was presented the Team Ag Ed Contributor award for his support of FFA, FFA Alumni and Agriculture Education. The evening concluded with a live auction, silent auction and crowd-pleaser performance by The Fun Pianos, Dueling pianos entertainment. All funds that are raised as part of the state convention are given back to support the FFA members through various state level programs.